← Guest Post: ‘Mr Gabor’s Day Out,’ by Michael Costello. The roar of a high-performance engine and the squeal of tyres turns my head. A shining, beefed-up muscular mini, containing a skinny young man with short hair and wearing dark glasses, speeds down the hill towards town. The man’s tattooed right arm is hanging out of the driver’s window, juxtaposed against the shocking pink, white-striped car body. Blue Subaru with gold trim, parked outside the Ulster Bank. Low to the ground, it is the first to be affected when the manhole covers burst open and the flash flood waters from the heavy rain start to flow into its twin exhaust pipes. The lad with spiked-up hair and acne, in his smart bank uniform, nips out to see what can be done, but he can’t leave his customers to queue for long. The car won’t budge; when 5 o’clock comes, taxi for him, low-loader for his motor. 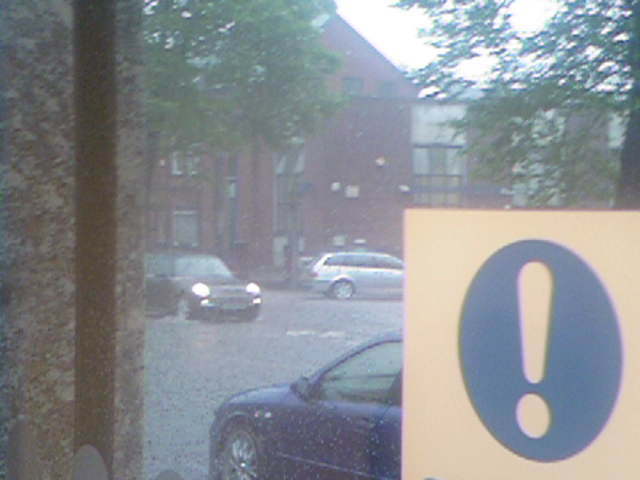 The flood, Ormeau Rd, 2007. Picture by J. O’Rourke. This entry was posted in Uncategorized and tagged Belfast, cars, flood, Jason O'Rourke, micro-fiction, Mini, Ormeau Road, short story, South Belfast, Subaru, Ulster Bank, Vernacularisms, writing. Bookmark the permalink.